Summer coastal colors decorating ideas inspire me to bring a relaxed feel to any room and today I’m talking about aqua. In planning your summer decorating, you can’t go wrong with reflecting colors from nature. The ocean invites, flowers are blooming and the light is beautiful! Color can be woven into our interiors with a few accessories. 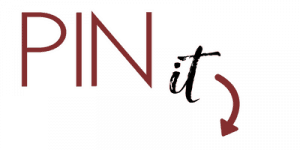 I’m joining in with some blog friends today, so scroll down to the bottom of this post for more inspiration. Thanks to my friend Jennifer from Town and Country Living for putting this together! Living in South Florida admittedly makes it easier to infuse my home with a coastal vibe year round. Summer interiors are right at home down here, yet surprisingly many of the homes I see (sorry local friends;-) are just too obvious. 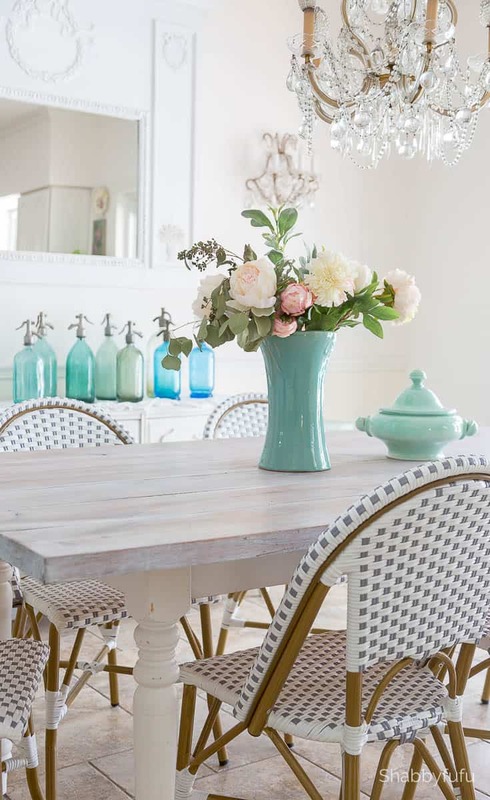 Let’s delve into subtle ways to bring a coastal summer vibe that you can copy! 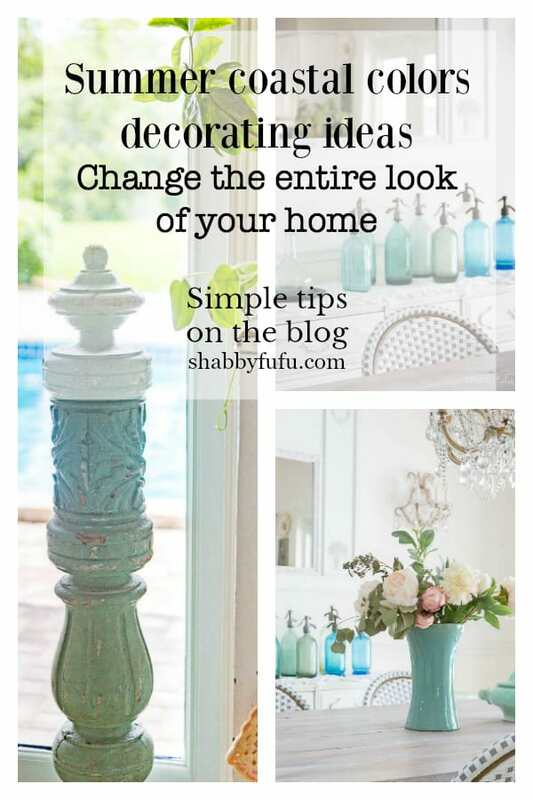 Summer coastal colors decorating ideas to copy! 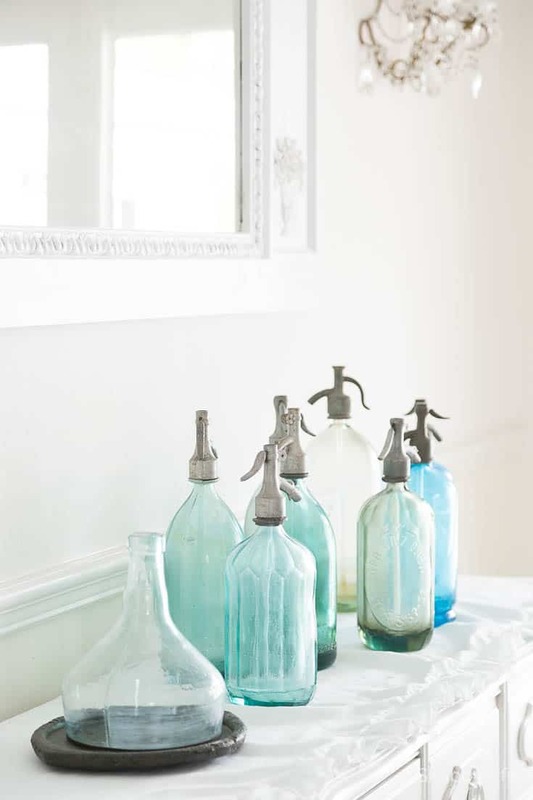 Adding objects in the colors of aqua, sea glass, sky blue or turquoise are natural to a summer coastal home. You don’t need to fully commit to painting your walls in aqua. Just bring the ocean look in with select accessories. When I first became a homemaker years ago aqua wasn’t on trend and thus harder to find. I started picking up vintage pieces at yard sales like the McCoy pottery vase above. The soupier is a recent find from a Paris brocante and for 3 Euros was worth adding to my collection! You’ll find lots of reproduction pottery pieces on-line these days. I don’t want to fuss too much with my home in the summer so I often use silk flowers instead of fresh. 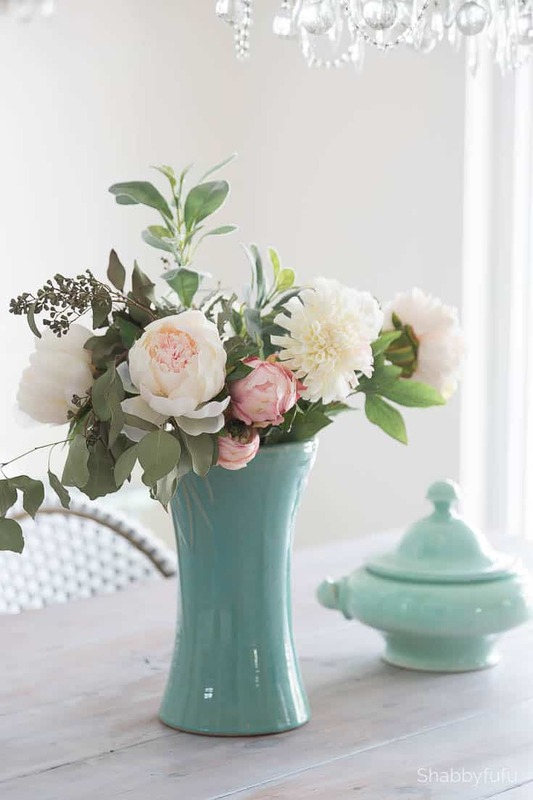 An easy arrangement in aqua has soft appeal and is maintenance free. While you have lots of that great summer light pouring in add glass pieces for an airy appeal. I love using old bottles like THESE, fishing floats like THESE , vintage demijohns like THESE and vintage syphons like THESE. Such a quiet look that’s easy to love with lots of impact due to the color. Because one piece of architectural salvage is so dramatic, it can be the focal point of your summer room. 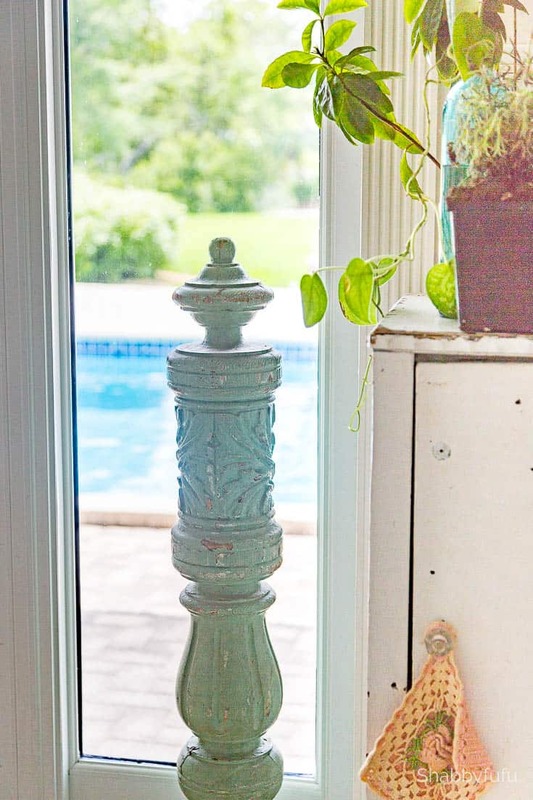 This seafoam green antique porch post is a piece that I’ve had forever! I shopped my own home today to bring it in the dining area for summer. Love Table Setting? I’ve put together a fun video for you below! It seems like when you bring the outside in with patio furniture and live plants summer has arrived. Shopping your own home, garden and porch is so much fun and saves money. I have lots of other patios chairs, so the French bistro chairs (see them in THIS POST) will be inside for summer enjoyment. Wall color used throughout my home is Benjamin Moore White Dove that has a touch of grey in it. Add collections from your family summer vacations. Glass jars filled with sea shells in addition to driftwood pieces bring are perfect for a casual chic summer home. Pillows with aqua or blue sea creatures bring that touch of whimsy in with being too obvious. Try to limit to one or two. Blue ticking stripes on table runners and bedspreads give that Hamptons or Nantucket summer look. If that’s more your thing delete the aqua and go for broke with blue! Keep your prominent furniture pieces limited to weathered wood and white. Add white linen to your bed ensemble and consider slipcovering your sofas and chairs in linen too. It’s your home, so make it personal and use what you love! Head over to the talented Kim’s of Sand and Sisal next. I have lots of coastal and summer ideas for you that you can access in the drop down menu above under SEASONAL or click HERE for a full list. Please share and pin this post! Janet, you can never go wrong with the colors of the sea. 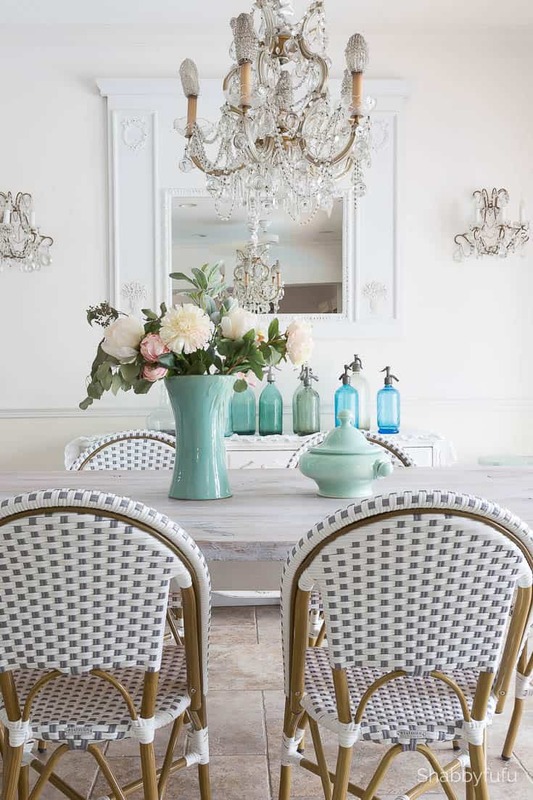 Great tips on infusing coastal inspired summer style. Where I live this is so true, but you know I like it done in a most subtle way. Thanks Kim! Oh the those colors of the sea that you so beautifully bring into your home are perfection. I love how you always bring the beauty of the outside in in such a elegant manner. Have a most wonderful Holiday weekend Janet! Thanks for all of the inspiration! Thanks Shirley and I’m waiting on pins and needles to see which house plan you select! This is beautiful, and so perfectly YOU. Have a lovely summer…I hope it’s not too hot! Thanks Ann…it’s pretty hot, but not unexpected here all the way south! Your beachy aqua pieces definitely give a summery feel. Just gorgeous! Thanks Shelley…it’s really become summer here where I live and I appreciate your kind words! This is an absolutely beautiful post!! All the subtle coastal colors are so appealing! That vintage chandelier, those seltzer bottles, those bistro chairs!!! Janet, your aqua touches are beautiful!! Just the right tone and I love the vintage pieces mixed in. Some day I’ll have to tell you about my very misguided and brief southwestern phase that resulted in the purchase of a huge aqua wall unit. Hah! Your romantic use of aqua is way more tasteful and lovely!! Thanks Lory and I’m in complete and utter shock that you would even consider southwestern in your home. Hah! I love how relaxing and inviting your dining room looks! The wedding chairs look great too! I’ve been working on giving our beach home a coastal vibe without it looking like a run – away souvenir shop! I’ve collected for years, bringing home treasures from every beach trip we took and most of my items are natural, like shells, or in the color palette you’re showing. I love aqua to begin with and being able to incorporate it into my decor is a real treat! I have floats, sea glass, white starfish, I’ve even gathered pinecones and magnolia seed pods as a nod to our area. Jars have become my new favorite display venue. They add interest and height and keep the pups from eating my goodies! Love the coastal look! Hugs! Thanks Leena…sounds like you do have a big bunch of treasures! Sooooo beautiful, Janet!! Love all your aqua coastal touches. Thanks Beth! Where I live really screams for aqua, but in a nice way. your style and images are always so dreamy. Janet, I love your collection of seltzer bottles! The colors are so pretty and you always style things beautifully! Thanks so much for being on the tour today! Thanks my friend and really appreciate all that you do for your blog buddies! Such a beautiful post! 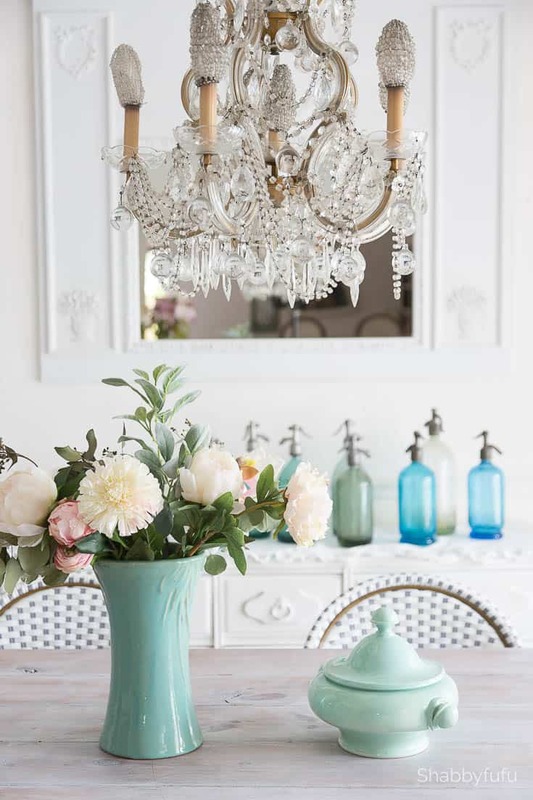 Love all the aqua glass and decor! Your home has such a fresh coastal style that I love. Hey let me know when you are in town this summer, would love to meet up an adventure in the city! Thanks Janine! If you can’t have a coastal look when you live on the coast then something is wrong, LOL. I will let you know…need to book something soon. I absolutely love, love, love the shades of aqua you used throughout! You create a coastal vibe with such elegance. And your collection of soda bottles is amazing! It’s so nice being on this tour with you! So great being on the tour with you too Kim and I always love seeing what coastally things you are up to! Thanks Susan and I love how you decorated for this tour too! Enjoy the rest of your week. The colors are stunning, I love the soft aqua’s, it’s so calming and peaceful! You have a gorgeous home, thank you for sharing all of your tips! Thanks so much Kristin…a little bit of calm in hectic days really helps! Oh friend, your tours get me every time! I love that you chose aqua. It pairs so beautifully with the soft pinks and whites. Gorgeous as always! I love aqua as an accent for summer but wouldn’t paint my walls with it, LOL! Fun touring with you! Janet, you know I love those pretty aqua shades, you always make everything look gorgeous! Thanks for stopping by, I now have a dog by way of my hubby! She’s a 10 year old German Shepherd. Janet, You never fail to give us a breathtaking tour! Your pops of color are watery and beautiful and serene. I love the look of glass that has been found on the beach after it has been tumbled around in the ocean and that is what your colors and lovely accessories remind me of! I always adore your beautiful bright colors! But that chandy is simply stunning and I can’t stop admiring it! So happy to join this wonderful group! Wow, I love the touch of colors you have throughout, they pop beautifully, with just enough color. Thanks for sharing.